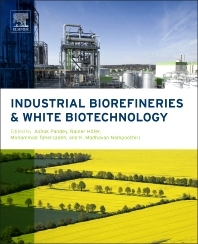 Industrial Biorefineries and White Biotechnology provides a comprehensive look at the increasing focus on developing the processes and technologies needed for the conversion of biomass to liquid and gaseous fuels and chemicals, in particular, the development of low-cost technologies. During the last 3-4 years, there have been scientific and technological developments in the area; this book represents the most updated information and technological perspective on the topic. Dr Rainer Höfer is owner of Editorial Ecosiris, which has consultancy and publishing activities in the domains of green chemistry, renewable resources, sustainable development, white biotechnology, and interculturation. He is the founder and owner of Editorial Ecosiris. Recent books by him include: R. Höfer, Ed., Sustainable Solutions for Modern Economies, RSC Publ., Cambridge (2009), A. Kazmi, B. Kamm, S. Henke, L. Theuvsen, R. Höfer, Advanced Oil Crop Biorefineries, A. Kazmi, Ed., RSC Publ. Cambridge (2012) ; J. E. McGrath, M. A. Hickner, R. Höfer (Edts. ), Polymers for a Sustainable Environment and Green Energy, Vol. 10 in Polymer Science: A Comprehensive Reference, K. Matyjaszewski, M. Möller (Edts.-in-Chief), Elsevier, Amsterdam, Oxford, Waltham (2012). K Madhavan Nampoothiri is presently working as Principal Scientist in Biotechnology Division of CSIR-NIIST, Trivandrum. Born on 30th May 1969a, Dr Nampoothiri took his graduation and post-graduation degrees from University of Kerala. In 1997, he obtained his PhD in Microbial Biotechnology from Cochin University of Science and Technology. He worked as Research Associate in Indian Institute of Science (IISc), Bangalore and as post-doctoral fellow of Alexander von Humboldt Foundation in Germany and Welcome Trust in the University of Newcastle upon Tyne, England. In 2001, he joined in CSIR-NIIST, Trivandrum. He is actively involved in Microbial Biotechnology R&D since past 16 years. He has nearly 90 publications, which include research papers in international journals, reviews articles and book chapters. Dr Nampoothiri has one Indian patent, five US patents and nine European patents. In 2003, he received Young scientist award from the Biotech Research Society, India.